Holy basil is a herbal plant commonly used South Asian Ayurvedic medicine and is known as "tulsi" in Hindi. This plant is used therapeutically for a number of reasons and is thought to help reduce weight due to its medicinal properties. Research published in the journal "Plant Foods for Human Nutrition" reports that holy basil may help reduce blood glucose, or sugar, levels and decrease triglyceride, lipid and total cholesterol levels. It may also enhance insulin secretion for diabetic health and decrease the stress hormone cortisol, which can cause weight gain. However, the use of holy basil for weight loss is not yet confirmed by scientific studies. Consult your doctor about using this herb to help you lose weight. Consult your medical or naturopathic doctor about using holy basil for weight loss. Inform your doctor about your past medical history and any medications and supplements you are taking. Purchase holy basil from a reputable health food company. Ask your naturopathic doctor about a good brand to use and how the remedy is taken. Read the product label carefully to ensure that the herb does not contain any ingredients you are allergic to. Ingest the recommended dose of dried holy basil leaves, as prescribed by your doctor or directed by the product label. The exact amounts of this herb needed for weight loss is not yet known. The traditional dosage is 300 to 2,000 mg of dried holy basil leaves per day. This can be taken in capsule form or infused in one cup of hot water to drink as a herbal tea. Do not exceed the recommended daily dose. Holy basil is also available as a fresh leaf juice and in concentrated extract form. The dosages of these forms may differ. Follow the product instructions carefully, and consult your doctor to clarify any concerns or questions you may have. As holy basil can lower blood glucose levels, it may interact with diabetes medication for hyperglycemia, or high blood sugar. This can cause glucose levels to dip excessively low. Do not use holy basil if you have diabetes, unless instructed to do so by your doctor. 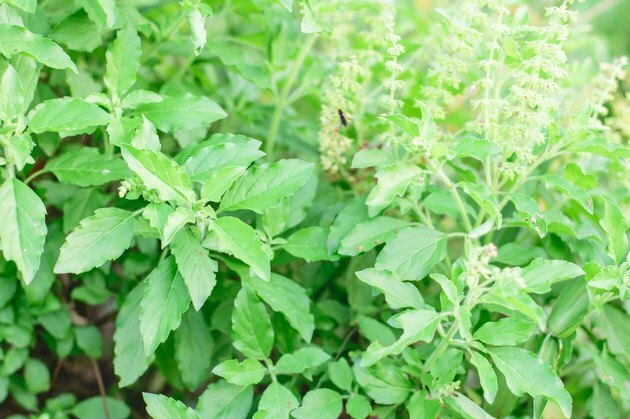 Like other herbal medications, holy basil can interact with other supplements and prescription drugs and should only be taken under the guidance of a health care professional. Obesity or weight gain may be due to an underlying condition. If you have gained weight in a short period of time, consult your doctor about your weight gain before trying to lose weight.